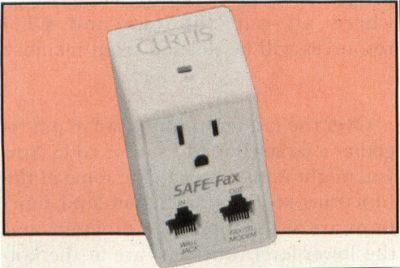 The Safe-Fax Surge Protector, from Curtis Manufacturing Company, is designed to protect electronic and telecommunications equipment from power surges. The unit contains two RJ41-type jacks and a single-outlet receptacle that can accommodate such equipment as FAX machines, modems, telephones and answering machines. Says Tom Judd, president of Curtis Manufacturing, "Plugged into any standard AC outlet, Safe-Fax helps prevent damage to hardware and assures that data transmission through phone lines is unharmed by surges, spikes and glitches." The Safe-Fax Surge Protector sells for $29.95 and comes with a one-year warranty. CIRCLE #121 ON READER SERVICE CARD.